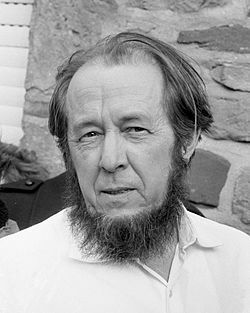 "Aleksandr Solzhenitsyn" (1918-2008) was a Russian novelist, dramatist, and historian. He is a Nobel-Prize winner in literature and was an elected a member of the Serbian Academy of Sciences and Arts in 1994. Among his works are "One Day in the Life of Ivan Denisovich, The Cancer Ward, First Circle, The Russian Question", and "Gulag Archipelago". The following is a personality profile of Aleksandr Solzhenitsyn based on his work. Aleksandr Solzhenitsyn is shrewd and somewhat inconsiderate. He is laid-back, he appreciates a relaxed pace in life. He is proud as well: he holds himself in high regard, satisfied with who he is. But, Aleksandr Solzhenitsyn is also unstructured: he does not make a lot of time for organization in his daily life.